Chronic absenteeism affects as many as 7.5 million kids a year and is a strong predictor of low academic achievement and high school dropout. • One system for tracking daily attendance, tardies, behavior and school culture data. • Methodology for selecting the daily behaviors you can track to reduce absenteeism. • Experience helping schools to create a culture of 100% attendance. Kickboard schools have significantly reduced chronic absenteeism through the use of our solution and professional services. 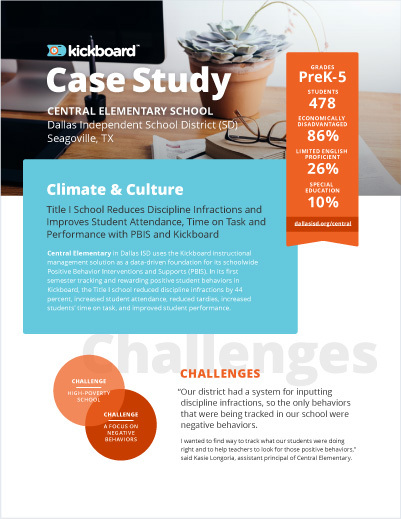 The key to our customers’ success is the ability to create a formative view of their school’s climate and culture to help schools become more proactive and preventative in addressing the problem. Conduct real-time behavior and culture reviews that reveal the underlying causes of chronic absenteeism. Help students achieve positive social and emotional character development, while reinforcing the behaviors that make up your ideal school culture. Manage goal-based incentives and rewards that motivate attendance and positive student behaviors. Collect and analyze attendance and tardy occurrences easily. Create a more positive school culture and nurture a culture of attendance. Form an attendance review team to regularly monitor attendance data, determine root causes, and communicate issues as they arise. Provide teachers and school leaders with multiple levels of support to help students stay more engaged and act positively. Set automatic triggers to address absenteeism patterns before it's too late. Learn how to understand and address the root causes of attendance and tardy issues. 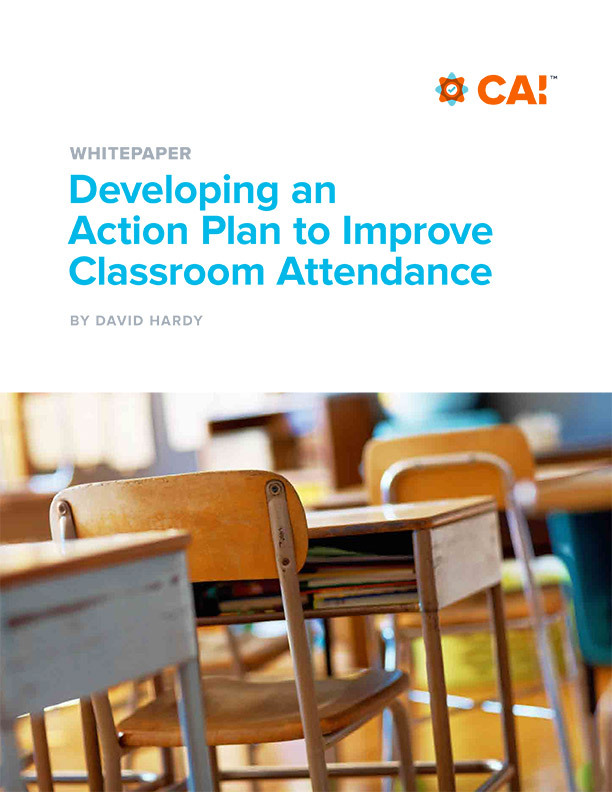 Use data to identify which students are at risk, so you can intervene before isolated absences becomes chronic absenteeism. Using Kickboard to create a focus on character and improve positivity in the school culture. 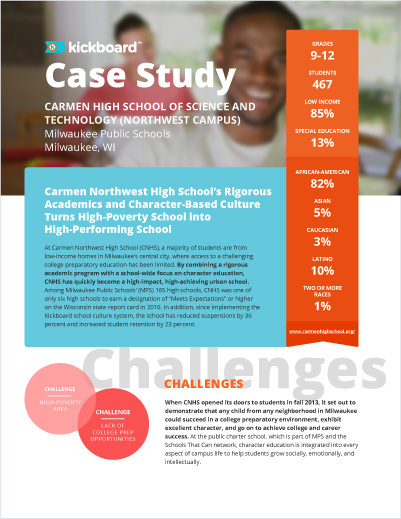 CNHS increased student retention by 23%. Using Kickboard to manage and evaluate incentives and using Positivity to increase attendance and decrease tardies. “With PBIS and Kickboard, our teachers are focused on the positive. As a result, attendance is up, tardies are down, and our school culture is better,” said Longoria.